IRVINE, CA--(Marketwired - Nov 28, 2017) - Cannabis Science, Inc. (OTC PINK: CBIS), a U.S. company specializing in the development of cannabinoid-based medicines, announces that its research staff is nearing completion of a novel new cannabinoid formulary to treat the Asthma and Chronic Obstructive Pulmonary Disease (COPD) Overlap Syndrome (ACOS) with clinical trials to follow upon completion. "Our recent development of our MDI and Rescue Inhaler medications for these patients in part is the reason this research evolved to treat this under-diagnosed syndrome. While our formulations for these medications achieve the desired effects for the illness targeted as a rescue medication they cannot treat effectively the diagnosis of the Overlap Syndrome. More interesting is the prevalence of ACOS observed among populations of patients diagnosed with COPD. Our new formulary will target four aspects of this illness inflammation, airway constriction, capacity, and anxiety. Cannabinoid extracts have many unique properties as well as an inflammatory agent these extracts also do aid in controlling anxiety and it is our belief lung capacity. The strain we are working with is one that has lung expansion properties, this certain strain chemical makeup causes the lungs to expand or hyper-inflate once the dose has been administered and over a subscribed to therapy term is expected to build back lung muscle strength in the weakened lungs along with increased volume capacity as the lungs are stressed much like breathing exercises would do for the patient that no longer has the ability to effectively do deep breathing exercises," stated Chief Medical Officer: Dr. Allen Herman. "This is an immense market segment, with approximately 5 million people with diagnosed cases of COPD in the United States alone and the 20 % prevalence of the Asthma, COPD Overlap Syndrome offers a known market of approximately 5 million doses per month potential for CBIS' new formula. As CBD has shown to be an effective tool in the fight towards these two ailments by many studies and acclamations by CBD users, our new formula will be designed to target both ailments with the most effective medication compounds for those diseases as a group instead of having to target each one separately with differing medications. We are looking to provide both short-term relief and long-term therapy addressing the Asthma aspect of the syndrome, and will provide the needed support for the COPD aspect targeting inflammation, constriction, anxiety, and panic, which often times leads to ER visits and potentially longer hospital stays. With the Cannabis extracts providing ingredients to aid in the mentioned targets along with the rest of the new formulary ingredients, this will likely prevent many of these problems. The ability of Cannabis extracts to give patients the calming effect offered in a non-opioid form of medication will help calm patients and allow the other ingredients time to work before a full-fledged panic attack ensues thereby multiplying the symptoms present," stated, Cannabis Science, Inc., President & CEO, Co-Founder Mr. Raymond C. Dabney. The Company is interviewing test subjects for clinical trials of this new formulary now, the criteria being used is patients using supplemental oxygen with SpO2 (blood oxygen saturation level) under 95 % with oxygen and under 87% without oxygen. 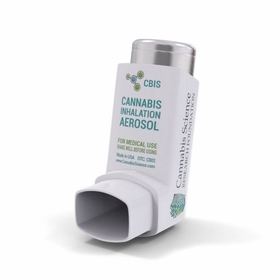 The goal of this trial is to observe for the SpO2 levels to increase over the period of the trial as well as mental health by way of easing anxiety associated with Asthma/COPD flare-ups, this trial is to monitor the effects of various cannabinoid levels and combinations with the patients who were chosen. The Company has other trials in planning to follow this that will include different combinations of cannabinoids designed to target lung capacity and anxiety as well. Asthma and COPD are the most frequent chronic respiratory diseases. Although they have different characteristics, some individuals share features of both diseases. While there is not a universally accepted definition for ACOS, it was initially defined as symptoms of increased variability of airflow in association with an incompletely reversible airflow obstruction. The most recent COPD guidelines include this phenotype and its diagnostic features. Patients with ACOS are usually characterized by the increased reversibility of airflow obstruction, eosinophilic bronchial and systemic inflammation, and increased response to inhaled corticosteroids, compared with COPD patients. The relevance of the ACOS is the need to identify patients with COPD who may have underlying eosinophilic inflammation that responds better to inhaled corticosteroids. COPD and asthma have clear differences, but some patients may present with a mixture of both diseases. ACOS may be a manifestation of characteristics of Asthma and COPD that the patient is suffering from. The interest in recognizing these individuals lies in their better response to inhaled corticosteroids (ICS) compared to those with COPD. This specific and differential treatment justifies the efforts to differentiate the subgroup of patients with ACOS from the large population of COPD patients. In general, the principles of workup and treatment are similar to asthma, COPD, and the overlap syndrome. Because this syndrome is seen more commonly in older populations, there may be a higher probability of adverse reactions to the various classes of inhaled agents or systemic corticosteroids. Cognitive deficiencies leading to lower medication compliance may be an issue, and general underdiagnosis and undertreatment may occur is another reason this medication shall be widely accepted. Whether the asthma-COPD overlap syndrome is a separate entity or a hybrid point within a spectrum of related diseases remains to be determined. One certainty is that the overlap syndrome is clinically relevant with a 20% prevalence in populations with airway diseases. With the aging of our population and the high prevalence and cost of overlap syndrome, clinical trials and further research are needed to investigate this unique population of lung disease. Cannabis Science recognizes the need for the development of new medications to treat this syndrome and are on our way to be the first in the development of a medical treatment therapy to treat this Syndrome with clinical trials to follow.